For as much as I talk about grilling meat, meat, and more meat, periodically, I need a solid reminder of something else that is fabulous when grilled, fruit. I was never a huge fan of pears when I was growing up. Actually, I was never a huge fan of any fruit when growing up. I know Mom did her best to make sure we ate healthily, but I was never running for the fruit basket for a snack after school. I would have rather had a burrito. Of course, as we get older, and our tastes mature, we find ourselves enjoying foods we often turned our noses at when young. Sure, I still would rather have a burrito, but I am eating more and more fruit I would have never touched decades ago. For instance, pears were never a big item on my snack list. 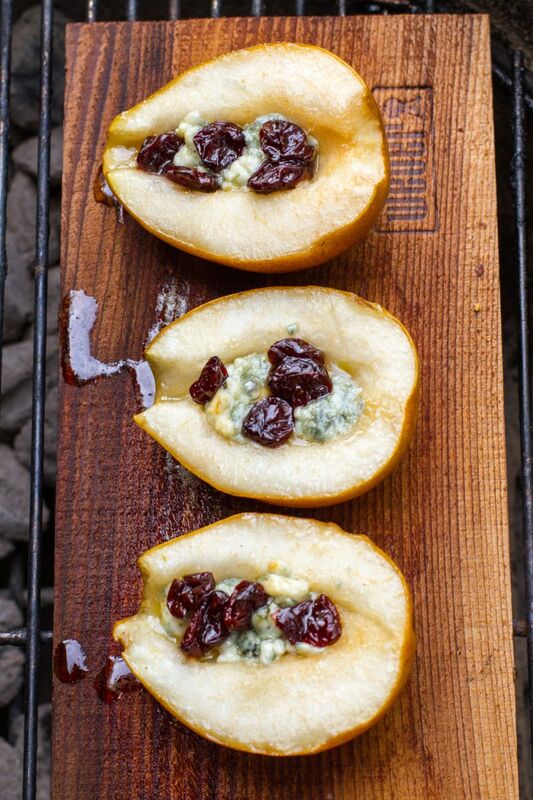 Now, how about pears grilled on cedar planks, stuffed with blue cheese and dried cherries, and drizzled with honey? I can not get enough. Are you trying to work more fruit into your diet? Add in the grill and discover a new world of texture and flavor. Your palate might have a whole new respect for fruit. Mine did, even though it still occasionally misses those after school burritos. 1. Slice the pears in half and remove the core. 2. Prepare a two zone fire for medium heat about medium heat. Place the pears flesh side down on the plank. 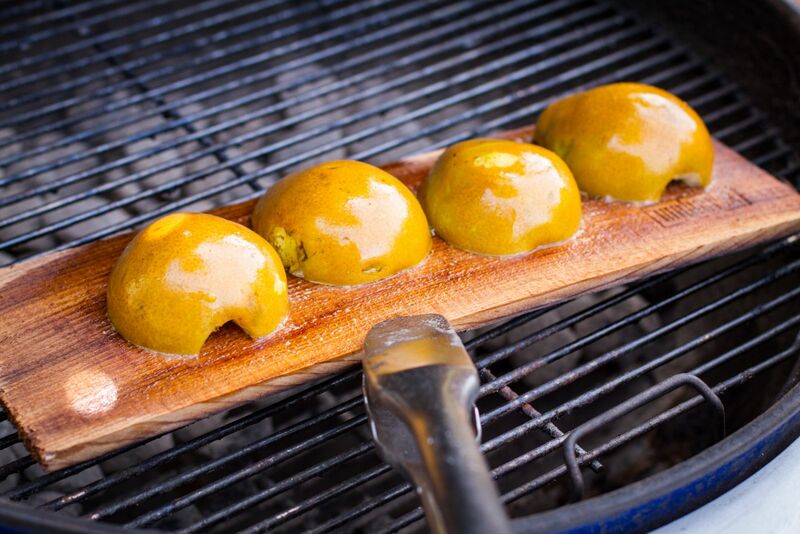 Place the plank on the grill over the coals and close the lid. 3. 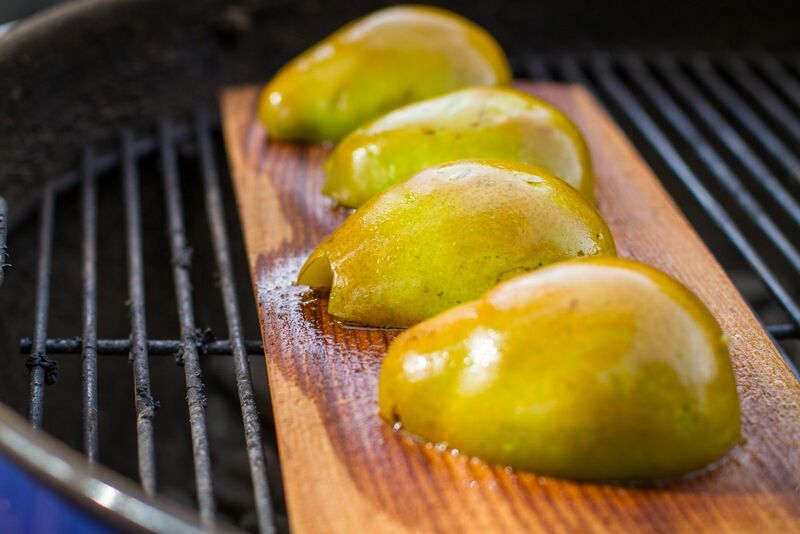 Allow the pears to grill for approximately 10 minutes. 4. 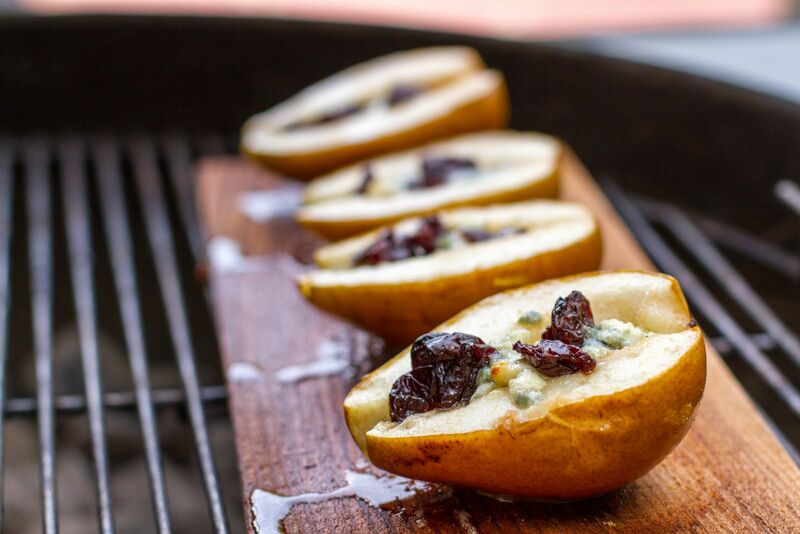 After the 10 minutes passes, slide the plank with the pears to the indirect side of the grill. Turn the pears over. 5. 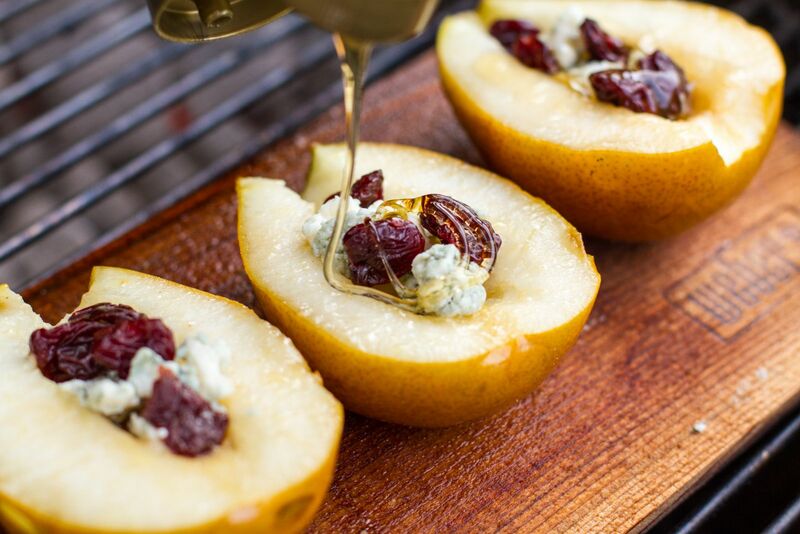 Fill the pears with equal amounts of blue cheese and cherries. Drizzle with the honey. 6. 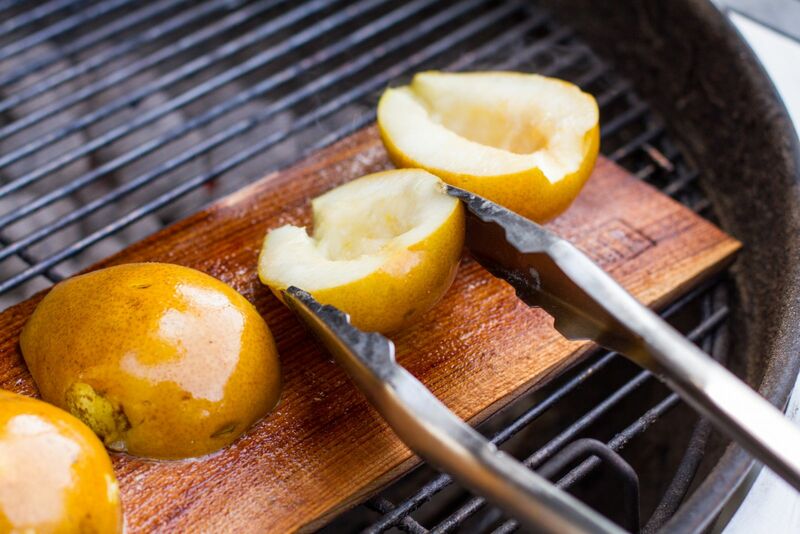 Allow to grill indirect, with the lid down, for another 10 minutes, or until the pears are soft. 7. Remove from the grill and serve warm. The pears reheat really well if you have leftovers.